From 1974 the Ovation Custom Legend (born upon request of Linda McCartney who wanted to give a Legend to Paul, but asked for fancier decoration) is the ultimate Ovation, the guitar that never disappoints, the Queen Bee of the woodtop family and for me the guitar of THE concert (Simon & Garfunkel in Central Park). In 2004, to commemorate the 30 years of this noble guitar, Ovation produced a limited series of 300 1719-30CM, built with the old skills, but updated with an OP-Pro preamp, an outstanding “bear claw spruce” soundboard and an LX neck with a double action trussrod. A fantastic guitar, that I bought in August 2014 from an English guitar player who found this page by chance, saw the “want list” and wrote me. 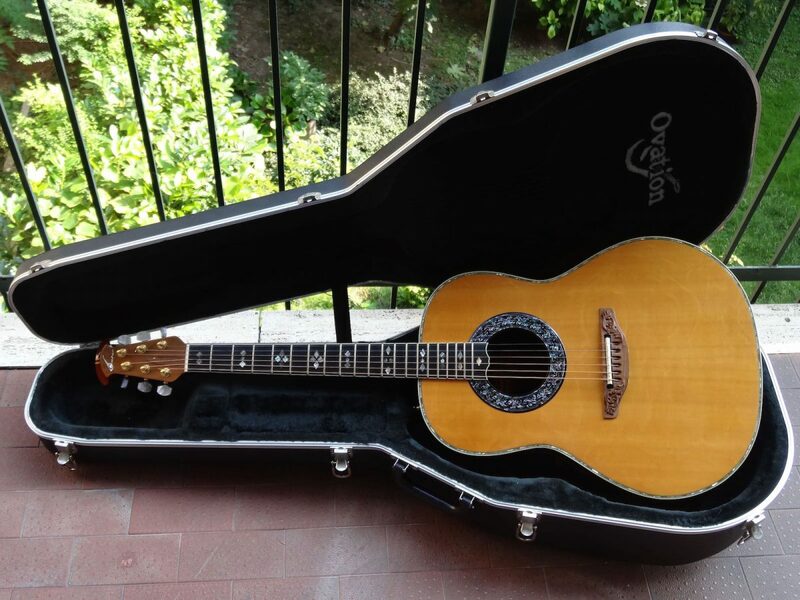 When I got it, this Ovation Custom Legend 30-CM had not been played much, so the voice was still somehow closed, but after being played at least once a week for a few months it woke and warmed up, showing its great class. I am sure it will get even better with time. I string it with 013 for more volume and tone. Thanks Daniel!